ATLANTA, GA--(Marketwire - February 1, 2011) - Foam fingers and headbands will be front and center as thousands of cheering college basketball fans celebrate the second annual Love College Hoops Week February 5-14. This fan driven initiative was created by The Collegiate Licensing Company, a division of IMG Worldwide, in partnership with Coaches vs. Cancer® to support the fight against cancer and celebrate fan affinity toward college basketball. Love College Hoops Week celebrations will take place at more than 50 of the largest college and university campuses across the country with student sections displaying school-specific I Love College Hoops themed headbands and foam fingers to show their team spirit and to raise awareness of the initiative. A portion of the proceeds generated from the sale of officially licensed Love College Hoops branded products will go back to the American Cancer Society ® (ACS) in connection with the Coaches vs. Cancer® program. In addition to merchandise sales, fund raising and awareness efforts will be available through a text-to-donate component running on the I Love College Hoops Facebook page and through promotional signage on display at various national and local retail outlets. Supporters may donate $5 to the American Cancer Society by texting "COACH" to 20222 - standard messaging rates apply. "CLC is honored to once again partner with the Coaches vs. Cancer® program, ACS, and the National Association of Basketball Coaches (NABC) for Love College Hoops Week," said Cory Moss, Senior Vice President for CLC. "With more than 172 million college fans across the country, we believe capitalizing on the excitement of college basketball to raise awareness about cancer prevention initiatives is a win-win for all participants." "Since the formation of the Coaches vs. Cancer® program, a collaboration between the National Association of Basketball Coaches and the American Cancer Society, more than $60 million has been raised in the fight against cancer," said Reggie Minton, deputy executive director of the NABC. "Almost everyone's life has been touched by this dreaded disease in some way, unfortunately, and we have to do all we can to continue that fight." "The Coaches vs. Cancer® program is not just about raising money to battle cancer; it's about heightening awareness, promoting research, and urging people to be proactive with early and regular screenings," added Utah Head Coach Jim Boylen, member of the NABC. "Through the Love College Hoops Week campaign, everyone involved with college basketball will help in this effort while showing support for their teams at this pivotal time in our season." Several hundred retailers from coast-to-coast, including campus retailers, will also support the cause by displaying point-of-purchase Love College Hoops branded signage highlighting their assortments of Love College Hoops branded merchandise throughout the month of February. Select campus retailers will also conduct an I Love College Hoops register-to-win contest, which includes a grand prize trip for two to the 2011 NCAA® Men's Final Four® in Houston and runner-up prizes of two 55-inch flat panel televisions. All prizes are courtesy of LG Electronics USA, Inc, an official corporate partner of the NCAA®. Contest entries are available at participating campus bookstores or by visiting www.facebook.com/ilovecollegehoops. 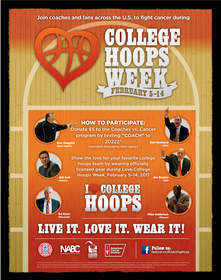 For more information on the Love College Hoops initiative, visit www.facebook.com/ilovecollegehoops. Located in Kansas City, Missouri, the NABC was founded in 1927 by Phog Allen, the legendary basketball coach at the University of Kansas. Allen, a student of James Naismith, the inventor of basketball, organized coaches into this collective group to serve as Guardians of the Game. The NABC currently claims nearly 5,000 members consisting primarily of university and college men's basketball coaches. All members of the NABC are expected to uphold the core values of being a Guardian of the Game by bringing attention to the positive aspects of the sport of basketball and the role coaches play in the academic and athletic lives of today's student-athletes. The four core values of being a Guardian of the Game are advocacy, leadership, service and education. Additional information about the NABC, its programs and membership, can be found at www.nabc.org. Coaches vs. Cancer® is a nation-wide collaboration between the American Cancer Society and the National Association of Basketball Coaches (NABC) that empowers basketball coaches, their teams, and local communities to make a difference in the fight against cancer. The program leverages the personal experiences, community leadership, and professional excellence of basketball coaches nation-wide to increase cancer awareness and promote healthy living through year-round awareness efforts, fundraising activities, and advocacy programs.